Bike rooms are a major trend right now. And no matter your reason for adding one – whether it be a requirement of a city ordinance or you just want to increase the appeal of your business, multifamily housing building or other facility – when done right, these can be much-valued spaces. The first challenge we’ll talk about is parking a specific number of bikes. In this situation you have a predefined number of bikes you will need to have bike parking spaces for. This number could be dictated by local ordinances, best practices, other guidelines or your own target. Do make sure to check your local codes. Many cities are adopting regulations that require minimum bike parking spots based on occupancy, square footage and more. With your number established, it then comes down to the area available for your bike room – will it be a fixed size or is the size flexible to accommodate all the bikes that will need to be parked? 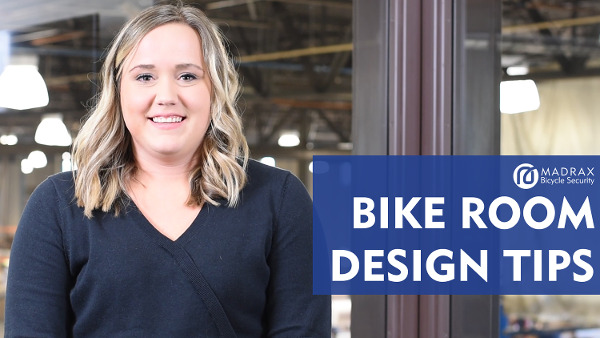 When the space can be changed to facilitate the number of bikes that need to be parked, there are lots of options available to you as you continue with your design. If you are working with a fixed area, your options may be more limited depending on the number of bikes to be parked in the space. 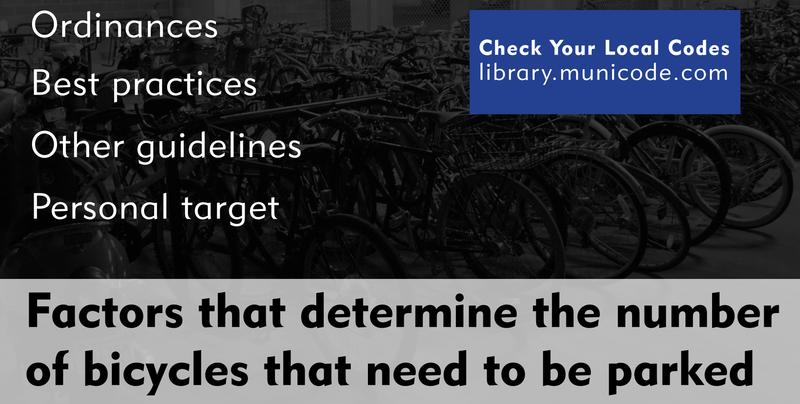 These limitations will determine the types of racks you can use and how bikes will need to be parked. To maximize the number of bike parking spots in a defined area, there are specific layouts and racks to help you accomplish this. To determine the best bike parking solutions for your bike room, you will need to first evaluate your bike room site. 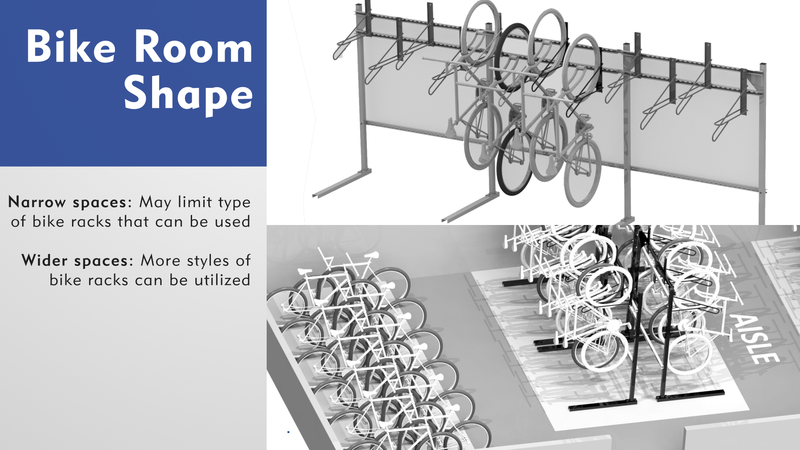 In designing a functional bike room that solves either challenge, you will need to know what options and limitations are provided by your area. The dimensions of the space will dictate much of the final design of your bike room – with overall size being a major factor. The bigger the room, the more options you will have. But the shape of your space will also impact your decisions. 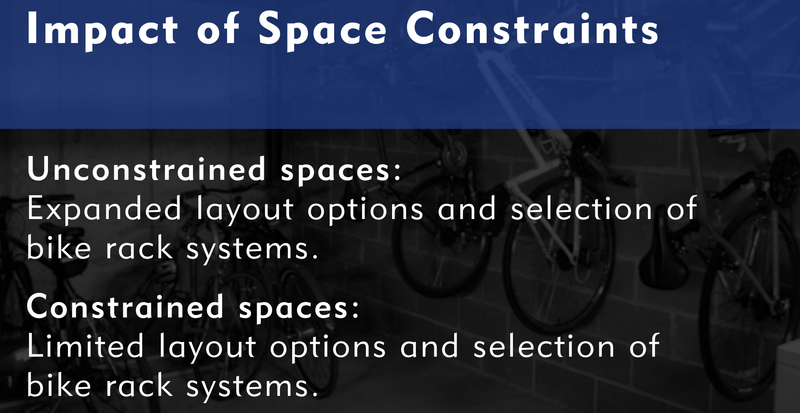 When dealing with narrow spaces, you may be limited to vertical bike storage options to park bikes and maintain aisles that allow for flow in and out of the bike room. Areas more square in shape or with greater widths allow for options such as ground-mounted racks and offer more ways to configure the bike room. For a more comprehensive understanding of bike storage layouts, spacing recommendations and more, read the Madrax Bike Storage Guide. The height of the room is also a consideration. 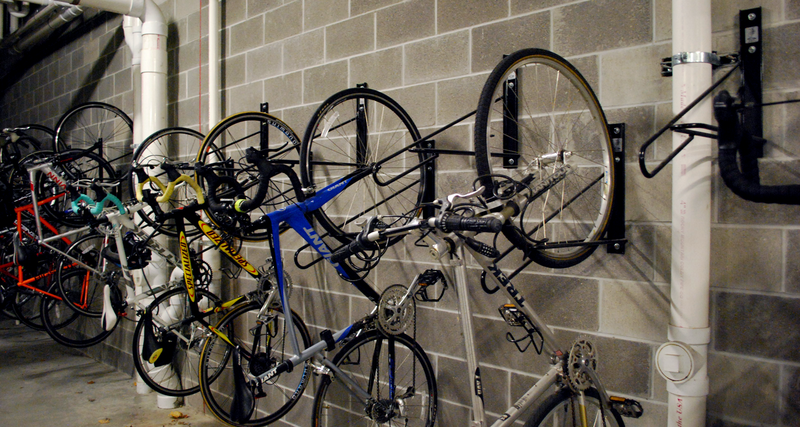 Vertical bike storage can be accommodated with ceiling heights of eight feet. If your space has higher ceilings, two-tiered bike racks are an option that make use of the additional vertical height and are good options towards maximizing the number of bike parking spots. The other thing to keep in mind when evaluating your site are the surfaces you plan to mount bike racks to. Are you looking to mount them to the ground or the wall or both? For ground bike parking, the surface should be concrete. This way you can surface mount the racks anchoring them to the concrete. 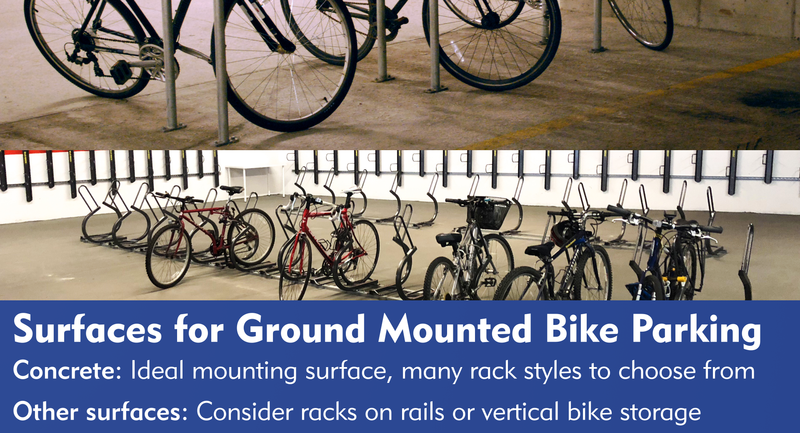 If your ground surface is asphalt, wood or some other material, you will want to plan on using racks on rails or you’ll want to look at vertical bike storage mounted to the walls. 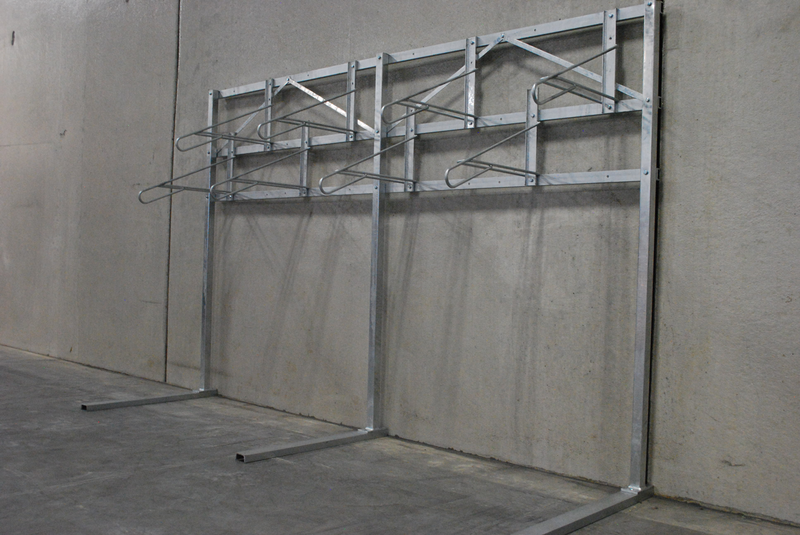 For vertical bike storage, concrete is again the preferred mounting surface material. As directly mounting the rack to the wall will require drilling the concrete, know what depth the concrete can be drilled and if that is enough for the rack you will be using. With wood or metal studs and other materials, other vertical bike storage solutions - which go into more detail in just a minute – make better options. The last item to note when evaluating your bike room are the obstructions that will be present. Electrical, pipes, windows and light fixtures could interfere with placement and restrict your use of certain bike racks. Knowing what your major challenge is, and the constraints that you must work within, lets take a look at bike parking solutions. We'll start with ground-mounted bike racks. Inverted U Bike Racks are the most common style of ground-mounted bike parking found in bike rooms. They provide the most security of any bike rack and are one of the most inexpensive. 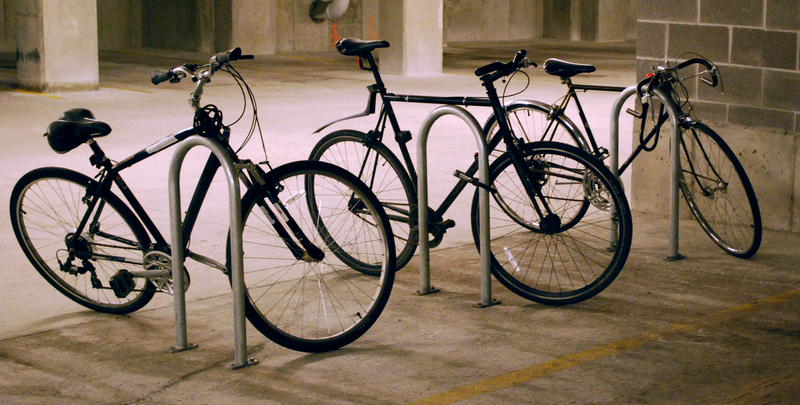 A single U Bike Rack is designed to park two bikes. In general, you should be able to park 4 bikes in a space of between 84- and 120-inches – depending on your spacing - using these racks. When the floor of your bike room is not made of concrete or you just want to reduce the additional work of measuring spacings required to install individual racks, bike racks on rails might be your best solution. These are racks bolted to rails at pre-defined spacing. Once assembled they can be left freestanding or anchored the ground. Another style of ground-mounted bike rack commonly used in bike rooms is a wheel-well secured bike rack. These have an element that holds the front wheel, helping provide further support for the bike. These racks can also be individually mounted to the ground or on racks. Switching to vertical bike storage. By parking the bike upright, it reduces the footprint of the parked bike and creates more usable floor space. Several styles of bike racks accomplish this. A direct mount vertical bike rack is going to give you the most flexibility in terms of placement and spacing. These are particularly useful when having to work around obstructions. These racks are then typically staggered vertically to maximize the number of bikes that can be parked in the area. A wall width of 180" will typically park 10 bicycles. It’s worth noting that multiple holes will need to be drilled to install each of these rack styles. If you’re unable to drill into the concrete of your walls or have a room constructed of materials like wood and metal studs, a wall mount vertical bike rack system will be more advantageous. 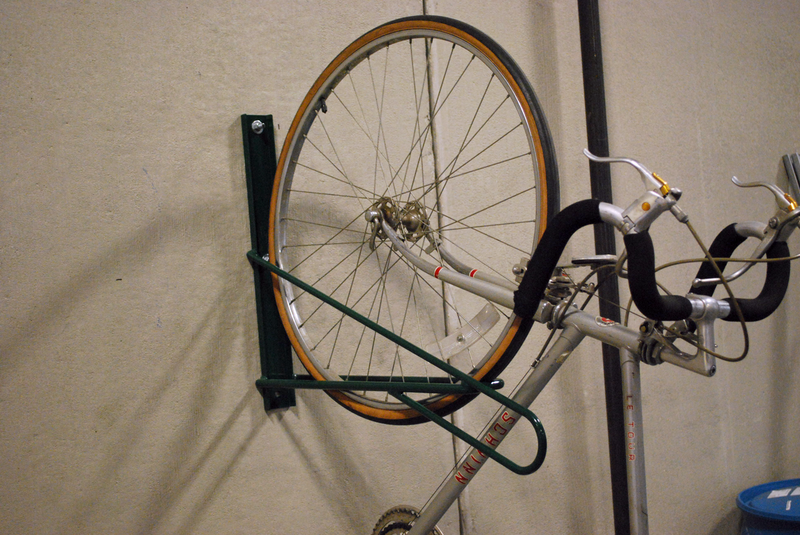 For these bike racks, a “track” is horizontally adhered to the wall and the rack element is then secured to the track. The appeal of this vertical bike storage system, besides it requires fewer holes to be drilled, is that the spacing and staggered heights can be adjusted without further construction. The rack element just needs to be repositioned on the track. These do require a smooth stretch of wall to place the track. Which means they may not be useful in areas that have walls with many obstructions. When you can’t drill holes in the wall or want to incorporate vertical bike storage in an open area without the use of a wall, look at freestanding vertical bike rack system. 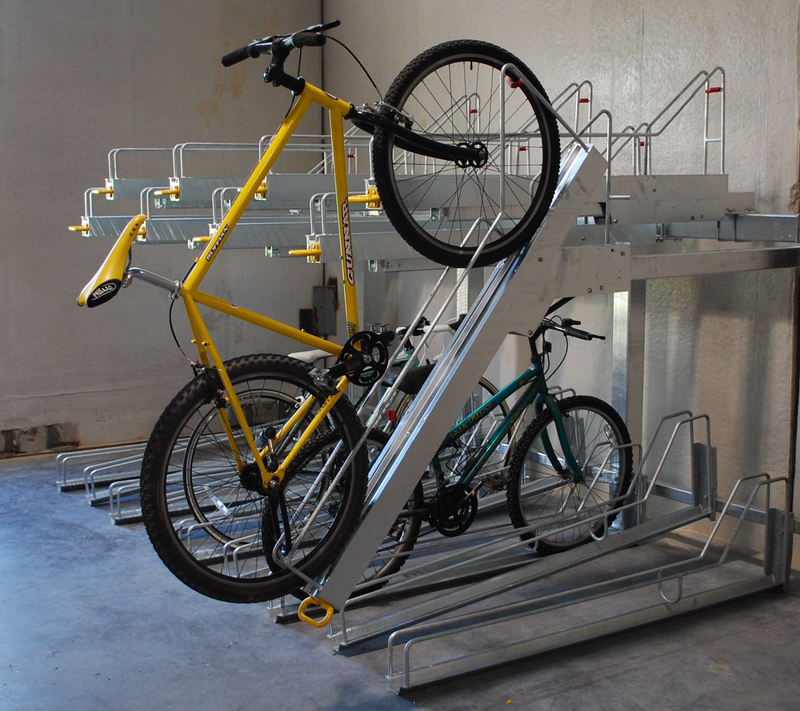 This system includes vertical bike racks mounted to a support that stands on the ground. 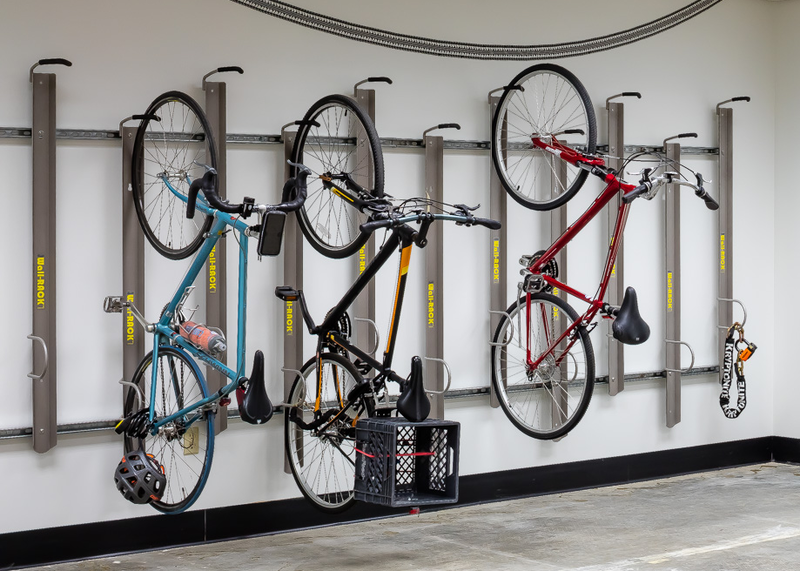 When you’re able to place freestanding racks in the open spaces of your bike room, you get close to maximizing the number of bikes that can be parked. They are typically the most-costly vertical bike storage option however. And when you absolutely must pack as many parked bikes into your space as possible, you will need a two-tiered horizontal bike storage system. In a span of 71” you can park 6 bikes. Making it about 52% more efficient than vertical bike racks. These are the most expensive solution and some have moveable parts requiring more maintenance than other bike racks. Two-tiered horizontal bike racks are available without the lift-assist feature which eliminates the need to maintain the moveable parts. Not necessarily a bike rack, bike lockers are worth considering for your bike room if security is of the most importance. Fully-encasing bikes in metal box makes it much more difficult for thieves to steal the bike inside. Bike lockers also come in horizontal and vertical storage options. Select units can be stacked and different design styles - like the pie-shaped locker - give additional flexibility in maximizing the number of lockers that can fit into an area. The last tip we’ll leave you with is don’t forget the amenities. Bike security is the must-have requirement of any bike room. But you can enhance the appeal of the room and satisfaction of users by including related amenities. A tire pump is almost a must-have with your bike room. Cyclists need to regularly fill their tires with air to maintain proper pressure or must deal with blown tubes or bent rims. When a tube does need to be replaced, or there are other fixes that need to be made to the bicycle, having a repair stand with standard bike repair tools makes it easy for cyclists to maintain their bikes and is a much-valued addition to the bike room. Also consider adding benches. These provide an area to rest for bikers. It also makes it easier for riders to change shoes or clothes, a common practice after commuting by bike. Every bike room has its own set of challenges and will require a thoughtful approach to successfully implement. If you need additional insights or help designing your bike room project, one of our Madrax reps will be happy to share their years of experience as part of consultative approach to helping you find the best solution. You can contact us through this form, by email (sales@madrax.com) or use the live chat on this page (available during regular business hours). Are you seeing a rise in the popularity of bike rooms? Let us know your feedback in the comments section below.